When I designed my Banner or Bunting Embroidery files, I realized that written instructions are good, but pictures are even better. So, I decided to write a post with step by step picture instructions on creating embroidery machine banner. Before you begin. Using an editing program merge your embroidery font onto your banner embroidery design. If you don't have an embroidery editing program I have another post that talks about which one I prefer. You can also just convo me on Etsy and I can set up your custom Banner and email the files. Step 1. Hoop your stabilizer. Use Medium or Heavyweight soft stabilizer. This means, not the crinkle kind or paper type. If you use Medium weight, it may be good to use two sheets of stabilizer. You will not unhoop your stabilizer until the final step has been completed. Step 2. Spray your fabric of choice for both the front and back with spray adhesive and lay gently over the top of your hooped stabilizer. Many people choose to use one fabric on the front and one on the back. I used white felt for both front and back. Step 3. Turn on your machine, secure hoop on machine and run the first stitch. It should run two times with a running stitch. It may stop between stitches to give the user a chance to cut away extra fabric if needed. You can either cut after the first or second running stich. Step 4. After your machine has done one or two running stitches, remove the hoop from the machine and cut both the top and the bottom fabric along the stitch. This pic is of my felt that has been stitched with the running stitch and then cut using applique scissors. It has not been finished with the satin stitch yet. Just the running stitch. 5. When the shape has been cut on BOTH top and bottom of your hoop, gently secure the hoop back onto your machine. Press the green button and let your machine finish the the shape of your banner. 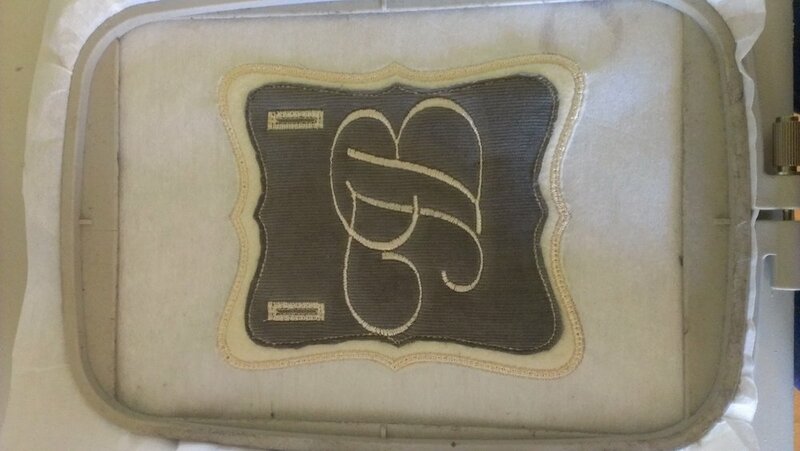 It will continue with a tack down stitch and then the satin stitch to finish. 7. Trim around the outside of the secondary frame on both sides using applique scissors. 8. Secure the hoop back into the embroidery machine and push the green button. The ribbon holes will begin to stitch. This is the time to pick a new color of thread for the font if desired. Otherwise just push start again and watch the machine stitch out your font! After this has been completed, you may now unhoop your design and trim the stabilizer from your banner.